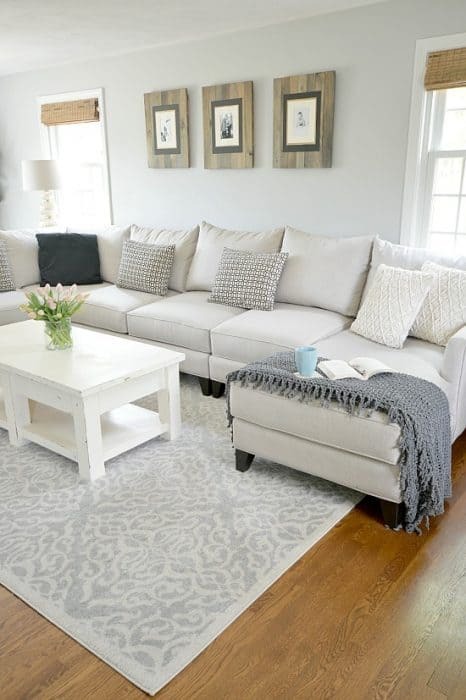 This living room reveal features a neutral palette with rustic and organic elements. It’s truly a space I’m proud of. I’d like to start with a quick note on last Thursday’s Reveal – from the bottom of my heart I want to extend a HUGE thank you for all the amazing feedback I’m continuing to receive. It’s already the most liked/pinned/commented/shared space I’ve done! It’s so rewarding and gratifying to see something that I worked so hard on appreciated by others. Hopefully it will also inspire you to tackle your own bathroom! Getting back to the topic on hand: My Neutral & Rustic Living Room Reveal! You’ve already seen most of this room through the several posts I’ve done on projects but I always get a nice sense of closure and a feeling of being “done” when I do a reveal post. There’s something very cathartic about it! How about we revisit what this space looked like before? 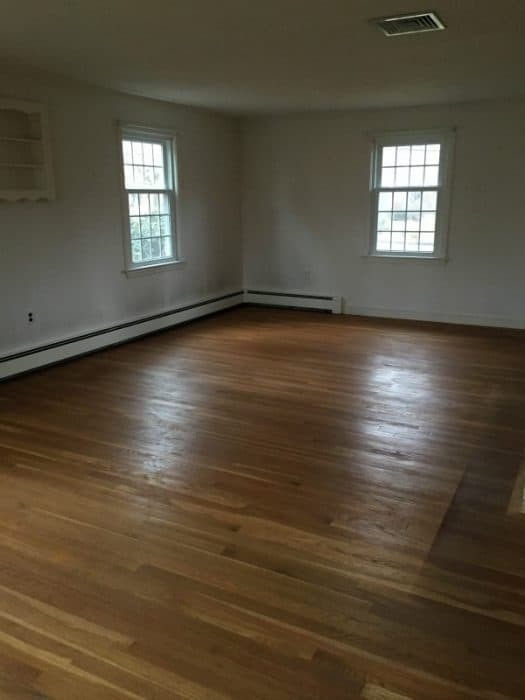 This will help you see just how far this space has come! Nothing neutral OR rustic about that! You might remember that the Rustic Picture Frames over the couch were a cheap DIY that I did earlier on in the year. And they are by far my favorite part of this room! The chaise is everyone’s favorite spot. Brian and I fight over it nightly! 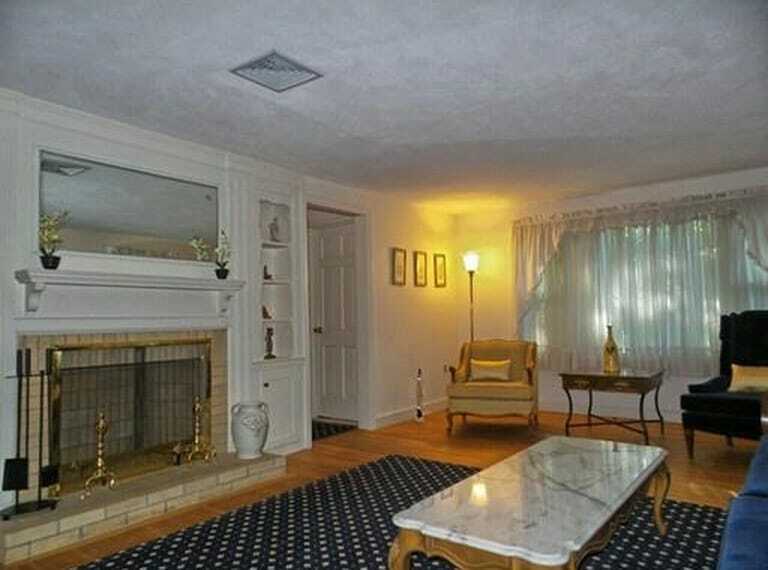 This living room is currently the only room with a couch and TV. We are hoping to remodel the basement in the fall and add a den off the kitchen at some point in the future. But for now, this is it. Living room. Family Room. Play Room (behind the couch is the designated play area!). We painted the walls Stonington Gray and accented with crisp white trim. The backs of the built-ins are accentuated with a dark gray paint, similar in color to the recently painted gray sideboard. 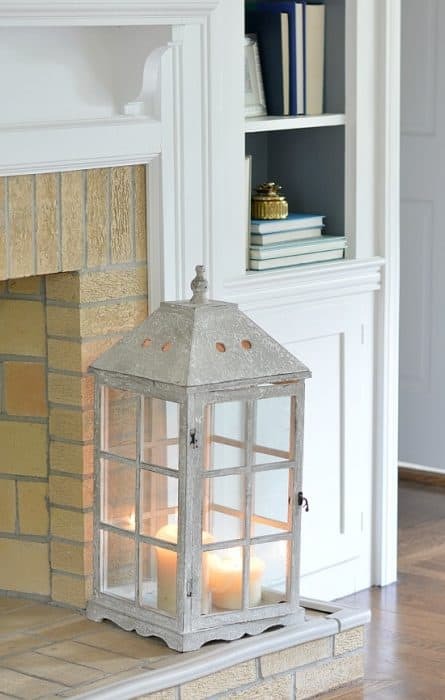 This lantern was the card holder at our wedding. I love that it is now a piece of sentimental decor. I’m so glad we decided to refinish our floors before we moved in. 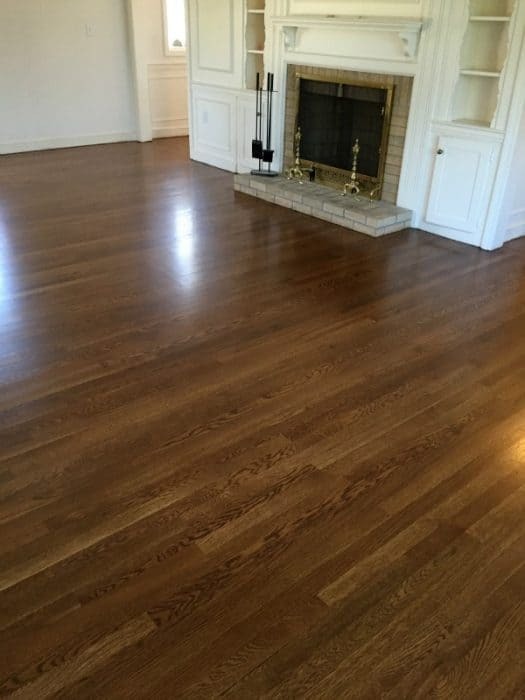 This stain color (Bona Provincial) was the perfect choice. It’s a wonderful medium toned brown that doesn’t bring out the blackness to the grain that dark walnut does. 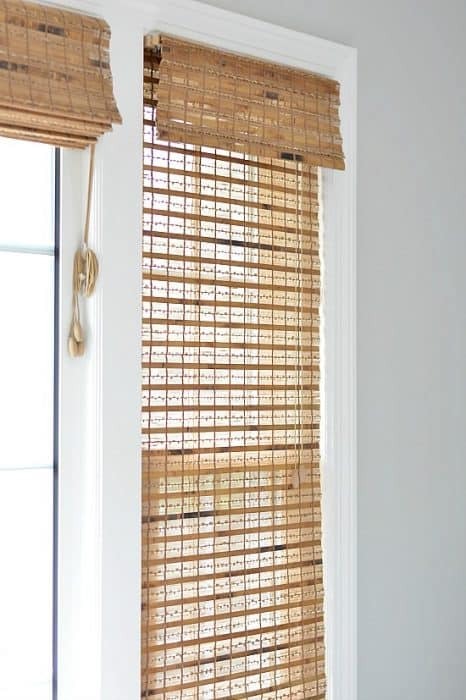 These woven wood shades (also known as matchstick blinds or natural woven blinds) are the perfect natural touch to the room. They add warmth, color and shield my eyes from the harsh afternoon sun. A big thank you to Blinds.com for sponsoring these in part! Everything about this room is me. 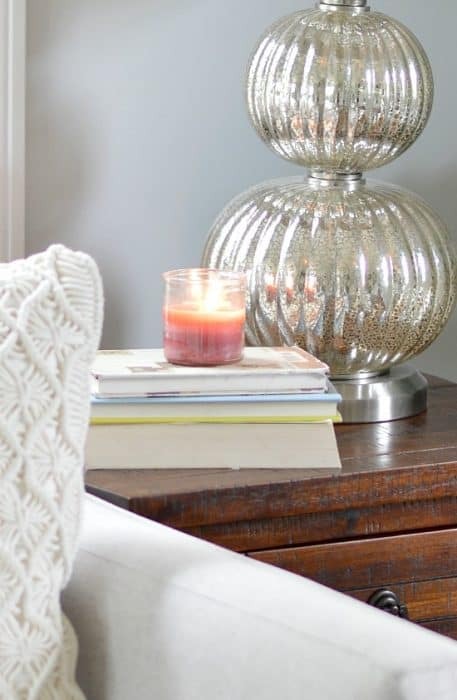 It’s bright, elegant and comfortable – the living room trifecta! Couch: No longer available (this one is similar). Love how bright the room is! I really like the gray on the walls & crisp white trim. What color did you paint the ceiling? I feel my ceilings are gray/white and would prefer a crisp clean white. Gorgeous! 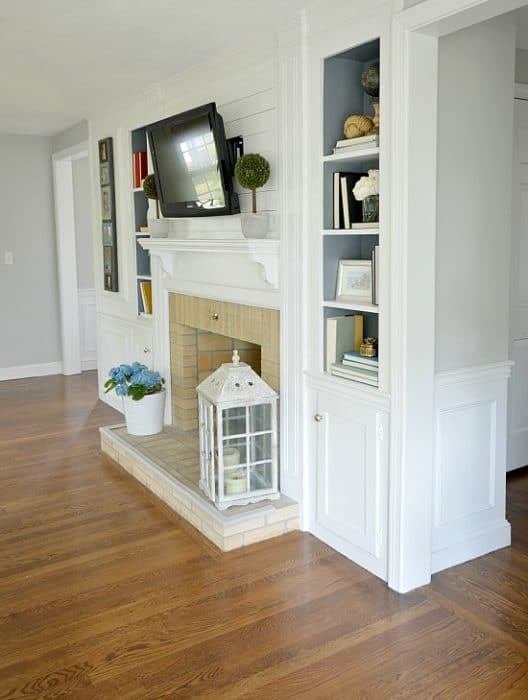 I love the fireplace and built-ins! Beautiful reveal, so bright and airy!! 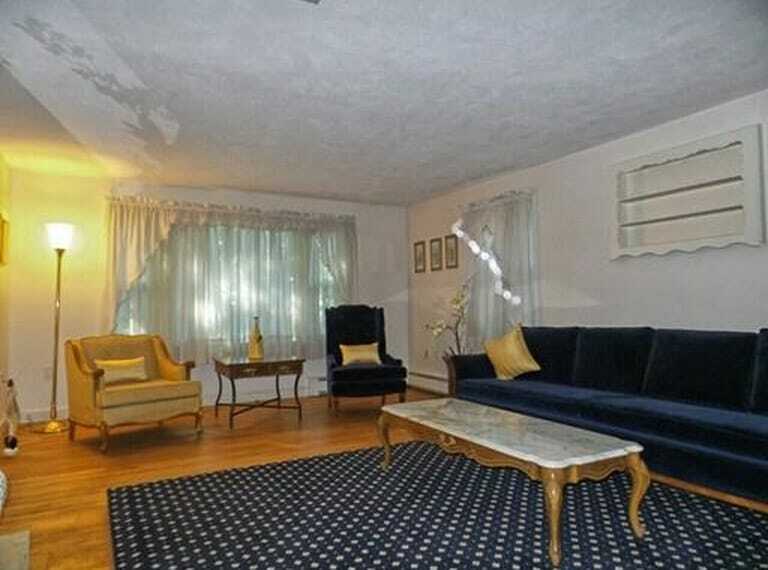 I love everything, especially the couch with that rug! What kind of plant do you have tucked away in the corner? I was just looking at with longing a lantern like you have by the fireplace. Everything you’ve done in your new home looks wonderful Jenna. I love this space! The neutral color palette is so fresh and “clean”. I am getting ready to move in a couple of months and I am looking forward to going more neutral as well. I will be pinning this for inspiration. 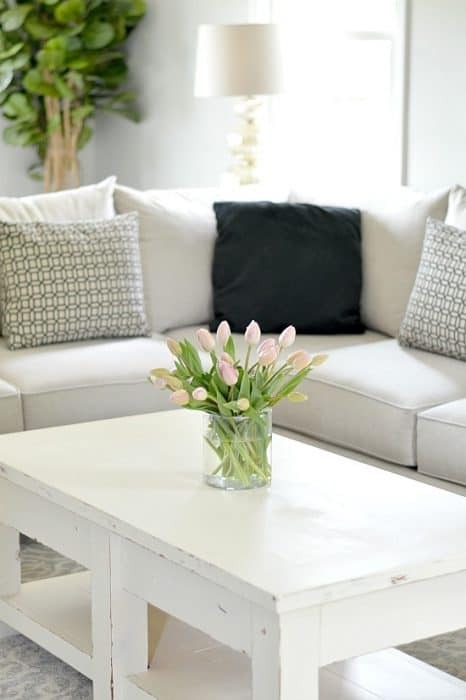 I am loving a cleaner more neutral look in this house! Thanks for stopping by, Randi! Awesome Jenna, love how bright and open the room is now and how organic it feels . The lantern there is 😘😘😘, how sweet ! It must be a treat to spend time in your pretty room .